Serving Lake Arrowhead, Camelot, Sherwood, Petenwell and Castle Rock. Rome Realty ... #1 Selling Office for Homes and Land in Rome. Sand Valley Golf Resort coming to Rome! Leave the hustle and bustle of the workday world behind when you enter the peaceful serenity of Rome. Whether you want to spend more time together as a family, experience the great outdoors or retire among newfound friends, the legacy of leisure is here. We hope you will take a few minutes to explore our site and discover why Rome is the ultimate family outdoor recreation area in Wisconsin.  Great Lakes. If you enjoy boating, fishing, waterskiing or swimming, you've come to the right place. The heart of Rome is four shimmering lakes, a tribute to unspoiled scenic beauty, uncrowded water recreation and sandy beaches. Maybe you've heard of them � Lakes Arrowhead, Camelot, Sherwood and 23,000-acre Lake Petenwell, the state's 2nd largest inland lake.  Great Golf. Rome is host to Lake Arrowhead's two renowned 18-hole championship golf courses. Pick your golfing pleasure. The challenging new Lakes Course, a scenic setting of secluded ponds and oak forest, or The Pines, a magnificent mature course tucked among tall pines and lush woodlands. Both have earned Golf Digest's highest honors. 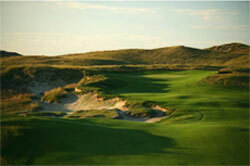 Construction of Sand Valley, a new world-class golf destination the likes of Bandon Dunes in Oregon is set to begin in 2014. Sand Valley will be laid into the giant sand dunes of central Wisconsin close to Lake Petenwell, nearly adjacent to Lake Arrowhead's Pines Course. When completed, Sand Valley will have up to four world-class Scottish style courses. America's next golf mecca is coming to Rome!  Great Outdoors. Rome's sprawling 50 square miles of woods and water offers the outdoor enthusiast almost unlimited recreational opportunity. Hike, bike or cross-country ski for an invigorating workout or ride the seemingly endless network of snowmobile and ATV trails to get reacquainted with nature. Sportsmen call Rome paradise whether stalking fur, fin or feather. There's plenty of room for everyone and never a shortage of peace and quiet.  Live where you play � and play where you live. Experience Rome's easy-going recreational lifestyle. Our lakes and streams, golf courses and woodlands offer the perfect setting for your weekend or retirement home. We hope you'll be coming to	visit us soon. 40 miles north of Wisconsin Dells and 13 miles south of Wisconsin Rapids.